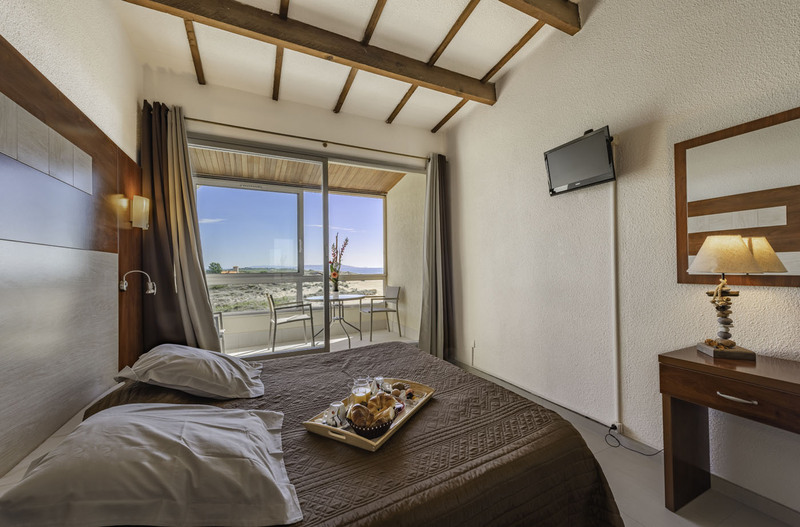 Between Sète and Cap d’Agde, the hotel Les Dunes *** is ideally located in the hollow of the dunes of Marseillan. The sandy beach is waiting for you! Lift, private parking, TV foreign channels, free wifi. On your large terrace overlooking the sea, you can enjoy your breakfast with musical background lapping the Mediterranean. The Alizé restaurant discover its Mediterranean cuisine in a family atmosphere on the terrace or in its air-conditioned room. Online booking site are fully booked? The hotel is conducive to rest and quiet, close to the shops and the amusement park for the evening, and the beach is not far from the morning after a full breakfast: the dream (without the crowd and the problems parking: private parking to book). The hospitality and professionalism of the staff of the establishment makes it an excellent place to stay on Marseillan. Impeccable cleanliness, breakfast fresh and hearty. The superb sea view. .. comfortable bedding and slightly small bathroom. A place where we will come back with great pleasure.